Do you have King Alfred Centre memories? Please share by posting a comment below. I suggested there were four diving boards, which no one seems to have disputed; I was wrong, there were five as the photograph clearly shows. With regard to the height of the diving boards, I am not exactly sure. The two low spring boards were perhaps about 2′, the medium height static and spring boards I think 9′, and the top board 15′. Whatever the answer, I think everyone agrees that the King Alfred gave many hours of enjoyment throughout the 1950/60/70s. 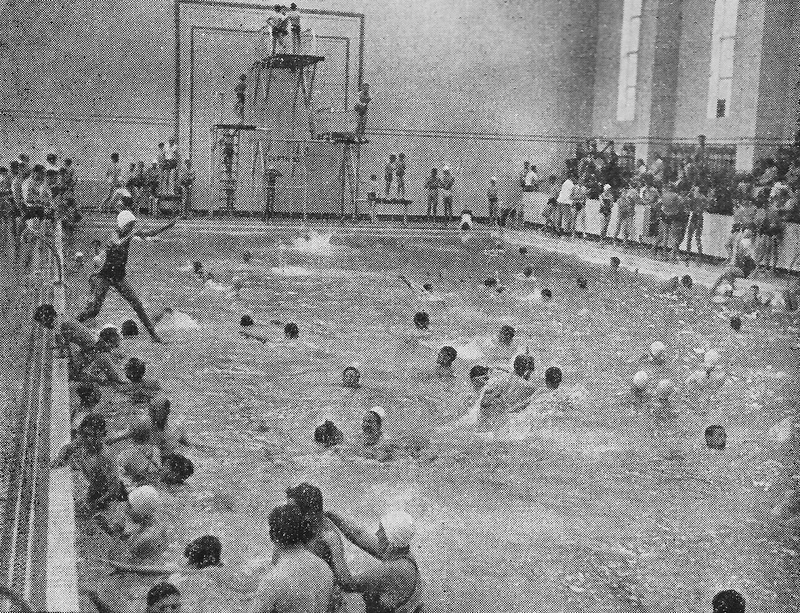 In the 1940s, Mum used to come from Eastbourne to train at this pool for swimming championships, including the Olympics. She told me it was built as an Olympic pool but that the tiles had not been accounted for in the measurements, so it was a fraction too small for Olympic swimming. Hi Marc, I’m pretty sure you are wrong regarding 33.3 meters long, meters weren’t around (in the UK) at the time it was built (1938), and Europe was almost alien to us! I thought it was 33.3 yards, with 3 lengths being 100 yards, but many others thought it was 36.66 yards with 3 lengths being 110 yards. Couple of points, when first built measurements were in yards not meters. Secondly I remember that in the winter the big pool was covered with a floor for dancing – we spent many a Saturday night dancing and using the bar that was at the front of the building, access only from inside. We went so regularly that we had a reserved table kept for us (there were 8 of us, that is 4 couples). It was a great place for an evening out. Just watched Sea Cities on Brighton (BBC2) and wondered what happened to the King Alfred Baths. All these amazing comments brought back lots of memories. I belonged to the swimming club, the Shiverers and used to train there every week and take part in galas in the mid to late 1950s. I remember that it was quite a talking point that it was a sea water pool and the measurements were in yards. Glad to know it still exists and has expanded.